Is “The Fighter” The Best In Its Class? Fans who appreciate movies concerning the “sweet science” of boxing have an embarrassment of riches at their disposal. When you put the words “boxing” and “movies” together, the first thing that usually pops into the mind of anyone familiar with the two would be the Rocky franchise. I’ve already posted about my admiration for actor-director Sylvester Stallone, and an early obsession with the original Rocky. And the subsequent inspiration it fed me to take on the challenge of losing weight and getting fit in my younger years. That movie was a definite turning point in the life of this “Average Joe”. It still resonates with me now. The entire list of franchise sequels (Rocky II-V, Rocky Balboa) that followed were good cinema in their own right, but never really approached the excellence of the original film. As the Best Picture winner at the Oscars in 1976, it propelled Stallone into the stratosphere of Hollywood heavyweight. Of course, Rocky isn’t the only heavy hitter in the boxing movie genre. Robert DeNiro’s tour de force performance as champion turned loser Jake LaMotta in Raging Bull is a movie I’ve watched repeatedly through the years. DeNiro became Jake LaMotta, training hard to get into fighting shape, then later in the film bloating with excessive weight to display the sad twilight of the fighter’s career. Ron Howard’s depiction of James J. Braddock in Depression era America in Cinderella Man would have been an inspiring film even without the boxing backdrop. And the cream of the crop might arguably be Clint Eastwood’s Million Dollar Baby, a formidable film which swept through all the major Academy Award categories. These movies are not just about the sport of boxing, but about the sport of life and the triumph of the human will. I knew a couple of weeks ago, when The Fighter was released on DVD right after its post-Oscar buzz, I would watch it immediately to see where it would stack up against the movie greats listed above. A true depiction of real life boxer Irish Mickey Ward, I didn’t expect it to measure up to Stallone and DeNiro. Even with the star power of Mark Wahlberg. I was blown away instead. 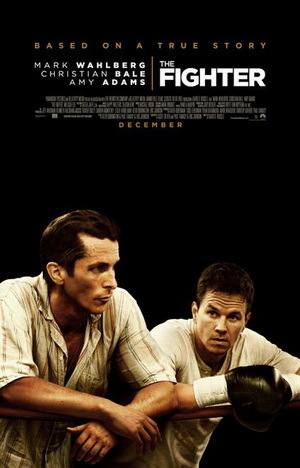 A staggering movie loaded with once-in-a-lifetime acting performances (see Christian Bale), The Fighter delivered, and then some. Mickey Ward was involved in several of the greatest welterweight matches ever. Even without the boxing and training footage here, this movie would have done him justice. The is the ultimate against all odds triumph on film, paying homage to films like Rocky. Sports Illustrated called the film the best sports movie of the decade, and “one of the best since Martin Scorsese backlit Robert DeNiro’s Jake LaMotta in Raging Bull“. Most interesting to me is the back story to The Fighter. Like Million Dollar Baby before it, the film was rejected by movie studios, even with Mark Wahlberg backing it at the height of his career. But Wahlberg believed in the inevitable outcome that it would be made, and he prepared himself daily for that outcome. Like Stallone decades before him, Wahlberg refused to give up his dream of making a movie about a once in a lifetime title shot. And I’m glad he did. The Fighter is a movie that compares with Rocky and Raging Bull on an impressive scale…and should inspire viewers with its message of chasing hope and dreams for years to come. LOVED this movie! One of the best in a long time, in any genre!